Why did you decide to start Ollie? My rescue dog, Pancho, started gaining too much weight on traditional pet food. I decided to investigate what was really in my dog’s food, and was disturbed to discover it was full of low-quality ingredients that were oftentimes unfit for human consumption. It was full of preservatives, artificial ingredients, and mystery meat. My co-founders had similar experiences, so we ultimately wanted to develop something that we could feel good about feeding our own pets. How is Ollie dog food different? Ollie is an all-natural, human grade dog food, which means it’s safe enough for you and I to eat. We tailor meal plans for each dog’s specific diet needs with a vet nutritionist. Then we freshly cook it and deliver it directly to your door. So, you have the exact portions you need when you need it. Whether it’s weekly, every other week or once a month, Ollie offers a flexible subscription that delivers the exact amount of food a dog needs when he needs it. Pet parents can also easily adjust meal plans as their dog’s weight changes and grows from puppy to adult to senior. We tailor our meals based on each dog’s information. Just type in your dog’s details – like age, weight, breed, activity level, and allergies – and Ollie’s technology will determine the appropriate vet-approved recipes and portions that best fits your dog’s needs. Unlike humans, dogs tend to eat the same thing all day, every day. Humans are able to balance out their diet throughout the day, so it’s important to make sure each dog’s meal is nutritionally balanced for them. So, all of our meals are formulated to fit all the requirements a dog needs. For example, for super active dogs, lamb is a great choice because it’s really high in protein and doesn’t have any grains. What are some of the meals you’re cooking up for dogs? We design recipes based on customer demand and currently have four offerings – lamb, beef, chicken, and turkey. Each of them have different human-grade ingredients, like sweet potato, spinach, carrots, blueberries, chia seeds, lentils, etc. Dogs love the taste of these real ingredients, so even picky eaters devour our food! We also have a line of treats (which we call "snacks") offering sweet potato, chicken, turkey, and beef strips. Why is it important for dogs to eat the right food for their health and wellbeing? We believe that food is the best preventative medicine for health – for humans and for dogs. As a former professional equestrian, health and wellness has always been important to me, and I believe that the key to your health is what you eat. So just like us when we feel good when we eat healthy, so do our dogs. In fact, dogs need 22 essential vitamins and minerals to stay healthy--and we worked with a veterinarian nutritionist to ensure our ingredients provide those. Studies also show the health benefits of eating a freshly cooked diet. In fact, a 2013 study showed that dogs who eat freshly cooked food live three years longer. How does Ollie support rescue dogs? At Ollie, we value giving back to the greater canine community. 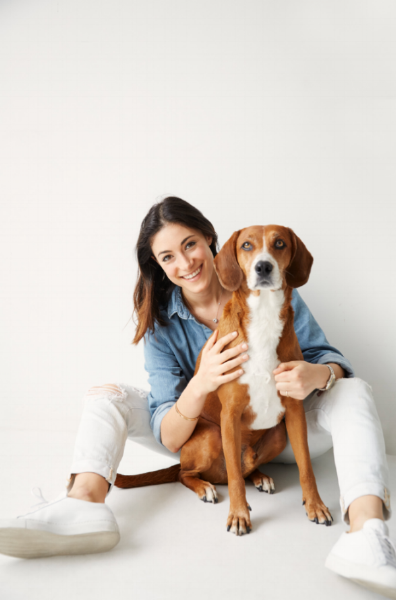 It’s built into our brand DNA: my two co-founders also rescued animals, and our staffers are committed to always putting dogs first. In addition to donating 1% of our company revenue to rescue organizations and kill-free shelters, we regularly donate our food to rescue dogs in need through the organizations we partner with. We also donate money to those them, whether it's by hosting a fundraiser for a shelter or writing a check to a non-profit to help their rescue efforts. Our employees often foster dogs (and bring them to the office! ), we host and attend events that support rescue organizations, and spend at least one day a year volunteering at a shelter. What is Ollie doing to help support Wags and Walks? We're sending our food to some of your rescue dogs, and making monthly donations to help support your "dogs in need" program! See we told you, they are amazing. We hope that you guys enjoyed learning a little more about Ollie. Now go check them out for yourself and spoil your pups with their delicious food and treats! Newer PostIt's Adopt a Senior Pet Month! Older PostHappy Howloween from Wags and Walks!